Since December is devoted to celebrating hot heroes who cook, I have another aphrodisiac recipe for you. My hot chef husband has a little foodie code phrase he likes to use whenever he’s got games in mind for later: he’ll suggest that I have a light dinner, so that I’m not too weighed down to play his reindeer games at bedtime. 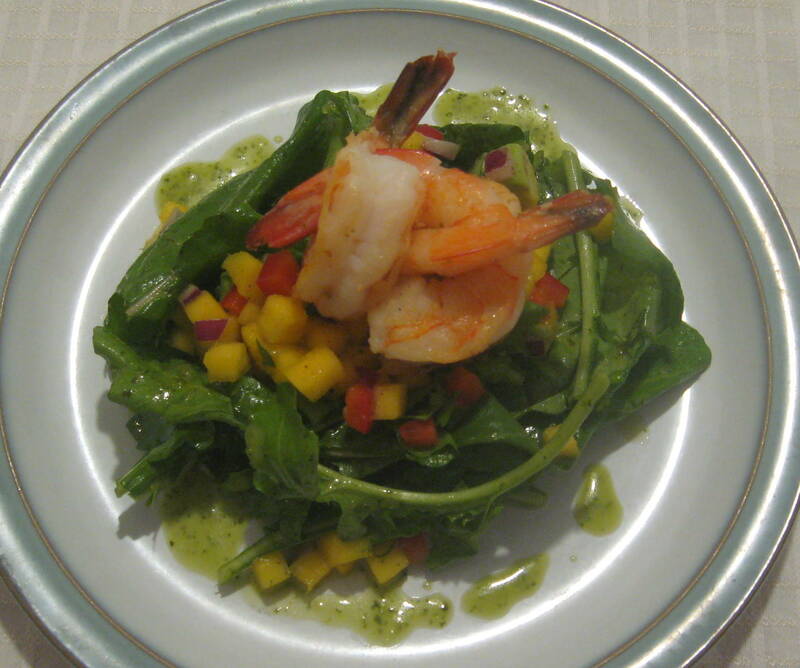 I don’t always obey (that can be fun, too) but for those nights when a light dinner is on the menu, Arugula and Shrimp Salad with Tropical Salsa and Lime-Cilantro Vinaigrette is a great choice. It’s a summery dish, but when the snow and ice pile up outside, I like to channel hot things inside – and this dish is chock-full of hot aphrodisiacs! Now buzz it all up. When the mixture is smooth, SLOWLY pour in 1 1/3 cups of vegetable oil through the feed tube (or remove that round-y part from the lid of the blender. Have a towel handy (that little tip can be universally applied) and I suggest pulsing the motor to get it all started (ditto). Taste it. Add salt, sugar, heat or vinegar according to your palate. Toss it all together gently, so you don’t over-smoosh the avocado. Well, how do you like ’em? You can buy them precooked in a bag, defrost them, toss them with the vinaigrette and serve them with the salsa atop a bed of mixed greens. You can get some regular-sized ones (16-20 to a pound) peel them, de-vein them, skewer them, season and oil them and grill them until they are pink. You can buy the big suckers and do all of that except the skewering. Okay, skewer if you want, but, really, the big ones won’t fall through the grill on you. Don’t have a grill? Put a tablespoon of oil in a saute pan. Season the shrimp. Heat the pan until the oil JUST BEGINS to smoke. Add the shrimp carefully. Toss them around until they are cooked through. Get them out of the pan just when you think their middles have lost that translucent blue color – you don’t want to eat little pink pencil erasers! To serve: Toss the arugula with a liberal amount of vinaigrette. Do it like the pros: wash up (or wear disposable gloves) and use your hands to pile the greens high on the plates. Put a mound of tropical salsa on top. Put the shrimp on top of the salsa. Garnish with more salsa or a drizzle of vinaigrette as it suits your whimsy. I’ll be honest with you: my greatest strength and my greatest weakness is the fact that I’m a practical cook. Translation: I substitute ingredients right and left. It’s one of my super powers, and I’m happy to share it with you. If you don’t like shrimp – use chicken or beef or pork or tofu! Don’t like tropical fruit? Go Southwestern – substitute corn and black beans and maybe some cheese for the fruit! 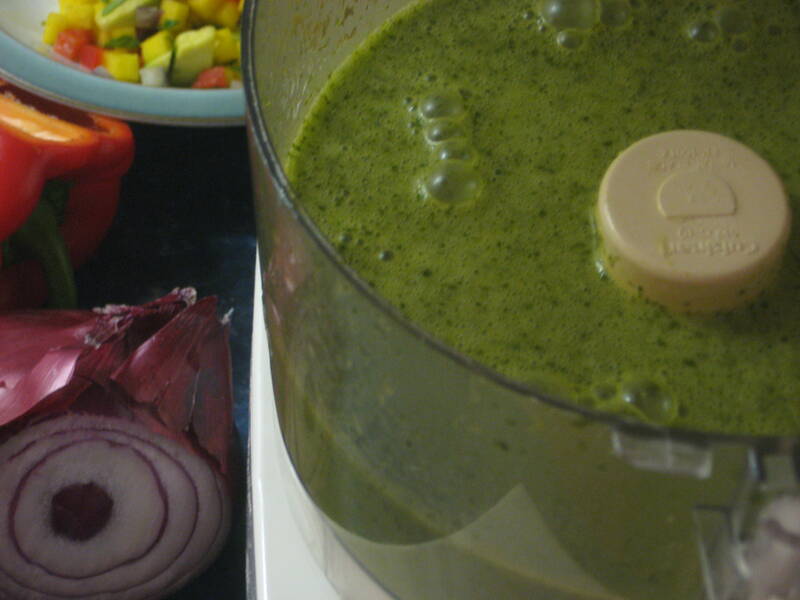 (Warning: do not substitute another fresh herb in the vinaigrette recipe. Yuck!) I’ve spent a lot of time learning how to play fast and loose with the rules of cooking while still creating great food. If I had to hang a label on my cuisine, I’d call it “approachable,” just like me. So – if you have any questions about how to tailor this recipe to your family’s tastes, send me an e-mail. I love to talk about how to please everyone at the table… enjoy the light dinner! ← Whip me, beat me… feed me! oooooohhhhhh yummy! I love shrimp, lime, cilantro, avocado and arugula – this has got to be amazing. I’ve always thought a true cook was one that can substitute and make up dishes with what every is on hand. When I teach cooking classes I always say that the measure of a true cook isn’t in her ability to turn out a perfect dish every time but in her ability to fix it if she screws it up. Then I assure them that I can fix anything!